"I'm not insane. My mother had me tested!" Sheldon Cooper wearing a black Superman logo T-shirt. This finely detailed Bif Bang Pow! 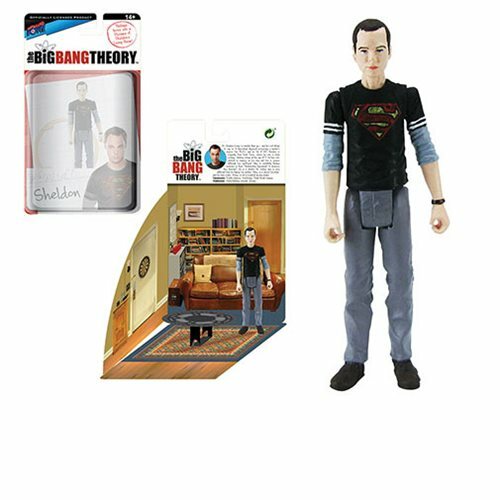 3 3/4-inch scale action figure of Sheldon Cooper from The Big Bang Theory captures the theoretical physicist wearing a black Superman logo T-shirt with white sleeve stripes. The scientist is also adorning one of his infamous long sleeve shirts under the tee and his entire ensemble is completed with the light brown pants and dark brown shoes as inspired by his outfit from an actual episode!